Get Wicked and Complete the Ultimate YO-KAI WATCH™ Experience! As the cause of life's troubles, YO-KAI are hiding everywhere! Explore the seaside town San Fantastico and the sleepy village Harrisville in search of these mischievous beings. Then travel 60 years into the past with Hovernyan to ensure the YO-KAI Watch Model Zero is created and your timeline is preserved! Battle online or via local wireless** to earn in-game rewards for your adventure. Or take control of a YO-KAI in Psychic Blasters, a revamped 4-player action mode! 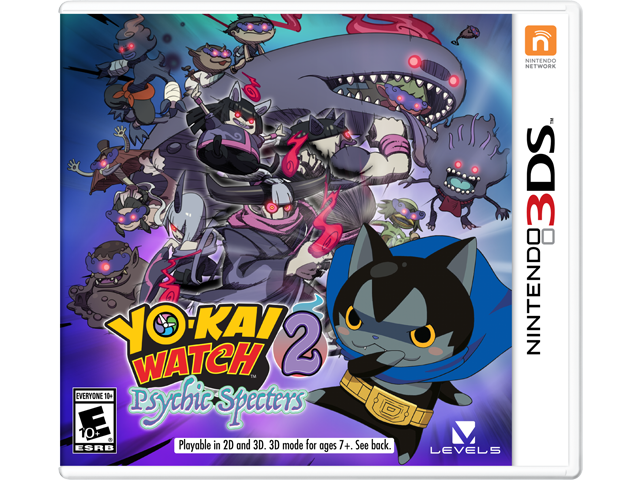 If you own the YO-KAI WATCH™ 2: Bony Spirits or YO-KAI WATCH 2: Fleshy Souls game, you can transfer save data from your Nintendo 3DS™ family system to YO-KAI WATCH 2: Psychic Specters and pick up where you left off. Prepare yourself for the deepest and most immersive Yo-kai experience yet! *Additional games and systems required for multiplayer mode; sold separately. Wireless Internet access required for online features. For more info, go to support.nintendo.com. **Software update required. Check https://yo-kai.nintendo.com/yw2/ for more details. ***Use Parental Controls to restrict 3D mode for children 6 and under.